A D.C. Police detective allegedly went nuts after kids pelted his Hummer with snowballs at 14th and U streets NW this afternoon. The cop got out of his car and started waving his gun around. While the Washington D.C. region has not suffered any major damage at the hands of Sunday's winter storm, there has been one casualty. The snowball fight scheduled for 6 p.m. Sunday evening has been called off. According to Metromix, its because of a lack of snow. While the forecast indicates that 1 - 3 inches may yet stick on the sidewalks of the District, the plug has already been pulled. The snowball fight's Facebook page reads: "Event Cancelled." The Twittersphere is in an uproar. 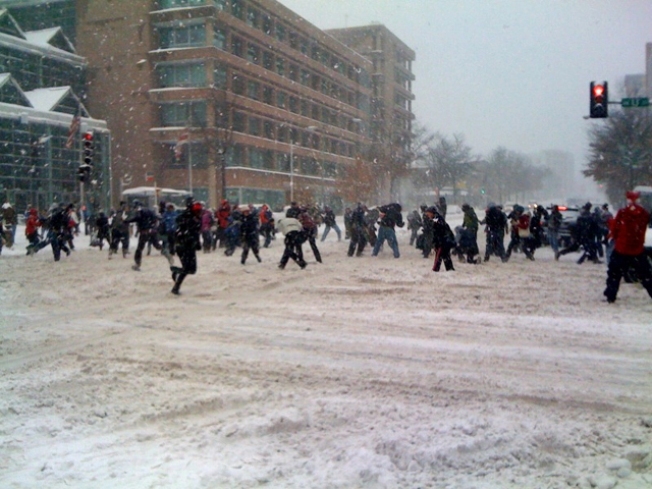 During last year's epic snowfall, the District became the Wild West of snowball slinging. Police brandished guns, traffic was snarled, and thousands were pelted. It looks like those magical moments will not be relived this weekend.